Those who were on the grounds at one of the three courses that the 2013 AT&T Pebble Beach Pro Am, or who tuned in during the first round coverage on the Golf Channel were treated to some great golf, and some not-so-great golf, amid some of the most breathtaking backdrops in the game. Hunter Mahan and Russell Knox are atop the leaderboard after the first day, both firing rounds of 6-under on Pebble Beach in benign conditions. Other notables like Brandt Snedeker is just two shots back, while defending champion Phil Mickelson is five shots behind. But as most of you who are familiar with this tournament know, this event is not just about the PGA Tour players. The Pro Am portion of the event features celebrities from all walks of life. 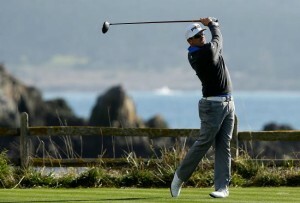 Athletes from other sports, actors, singers, politicians, and more come to Pebble Beach to participate in the event. After the first round of the Pebble Beach Pro Am, Scott Langley and amateur partner Doug Mackenzie lead the way, shooting an 11-under 59 o open. They lead Brandt Snedeker and partner Toby Wilt by one shot. There are a host of teams sitting in third place, including Jason Day and his partner San Francisco 49ers head coach Jim Harbaugh. Harbaugh gets out on the course just a few days after a tough loss in Super Bowl XLVII to his brother John and the Baltimore Ravens. Dustin Johnson and partner Wayne Gretzky also sit in third place, along with Patrick Cantlay and pro surfer Kelly Slater, and Jeff Maggert and country singer Clay Walker. And not that Bill Murray is close to the lead with partner D.A. Points, but he definitely made some headlines with his facial hair during the first round. It’s hard to explain exactly what Murray did, but it was certainly entertaining. The team of Murray and Points is a past champion of this event. They shot 5-under on Day 1. The PGA Tour players and their amateur partners will play on three different course this week. They will rotate between Pebble Beach, Spyglass Hill, and Monterey Bay. This entry was posted in News and tagged at&t pebble beach pro am, bill murray, brandt snedeker, hunter mahan, jim harbaugh, pebble beach, phil mickelson, russell knox, wayne gretzky on February 8, 2013 by Bryan.